From this very large family of bulbs we offer a choice range suitable for growing on rockeries, raised beds or trough and alpine house. 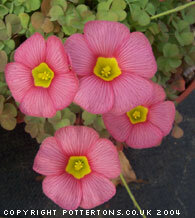 Generally all require a well drained soil in a sunny position. 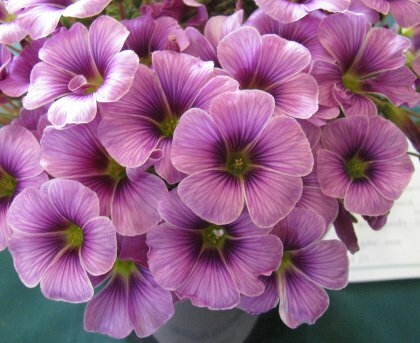 Beautiful selection with heavily veined pink flowers and very dark magenta centres in May-June, a very hardy plant that prefers a cool well drained, humus-rich soil. 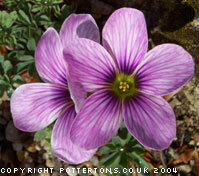 Quite similar to Oxalis Patagonia in form, shape & pattern, although the flowers appear lighter pink with paler veining. 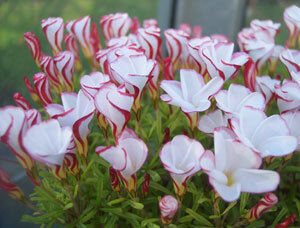 Large clear white flowers with a yellow throat on 8cm stems, attractive leaves, limited availability. Stunningly beautiful, autumn flowering for the alpine house or cold frame, relatively large soft-orange flowers and lemon-yellow eye. Limited availability. A marvelous foliage plant with a mass of large trifoliate grey felted leaves, which come up late summer and last through most of the winter. Yellow flowers occur in September, well drained soil full sun for trough or raised bed, naturally small bulbs. Recent name change from O. lobata, fragrant butter-yellow flowers on short stems from naturally small bulbs. Easy for pot culture in the greenhouse.